An overview of different process lines at the juice packer. In what form raw materials arrive at the juice packing plant and how they are handled. The water quality required for juice reconstitution and water treatment methods. The importance of accurate blending, and a comparison of different blending methods. How Brix and density are measured and the relationship between them. Different aspects of the pasteurization process, including choice of heat exchanger, deaeration and process control. How buffer tanks ensure smooth filling operations and avoid product recycling. Hot filling of non-sterile packages. The aseptic transfer of NFC juice from aseptic bags to filling machines. Cleaning-in-place (CIP) routines and the major parameters involved. Quality control of the packaged product. Juice packers process concentrate and NFC juice and fill the end product into consumer packages. Cost-efficient operation and gentle product treatment are essential. During raw material storage and handling, it is important to maintain conditions that prevent microbial growth in products. The quality of water used for concentrate reconstitution must be high. Water treatment methods aim to remove or destroy undesirable substances. Examples of these are organic matter, salts, chlorine and microorganisms. Reconstitution involves diluting one or a mix of different concentrates with water to the right Brix level. Although NFC juice is not diluted, NFC juices of different origins may be blended to produce juice with the desired properties. The more accurate the blending process, the greater the cost-savings achieved. In-line continuous blending offers advantages in certain respects compared with batch blending. Pasteurization, with either plate or tubular heat exchangers, is carried out to destroy microorganisms in juice before filling. A deaerator may be included in the system. An aseptic buffer placed between the pasteurizer and the filling machine(s) makes product filling smoother and increases production efficiency. In the hot filling method, hot product kills microorganisms on the surface of the non-aseptic container after filling. Effective CIP is essential for the high standard of hygiene demanded at the juice packer. The most suitable combination of temperature, time, type of detergent solution and flow rate is selected for a particular cleaning cycle. Quality control of the packaged product is determined by two prime factors, the properties of the juice and its microbiological status. Product sampling and analysis are regularly carried out, which also helps to define the processing conditions needed to maintain juice quality. Juice packers take in bulk raw materials (concentrate and/or NFC), treat them and then fill the final product into consumer packages. Sometimes the juice packer also carries out the distribution of packaged products. Typical operating steps at the juice packer are illustrated in Figure 7.1. This section discusses the processing steps that take place in a juice packing plant up to the filling machine. Packaging activities are covered in section 9, “Packaging and storage of orange juice”, and the distribution of products to retailers is outlined in section 10, “From juice packer to consumer”. Capacities of juice packing facilities vary greatly – from small plants producing 5,000 l/h packaged juice to large plants with an output exceeding 150,000 l/h. The larger facilities feature multiple processing and filling lines. One line of processing equipment can feed several fillers. Conversely, one filler can be alternately connected to several processing lines handling different types of product. Unlike the seasonal yet non-stop operation of fruit processors, production at juice packers is year-round and typically involves 2-3 shifts per day, 5-7 days a week. Production throughput is not uniform throughout the year. Peak output occurs normally in the run-up to the summer months and the Christmas period. Market pressure on juice packers is steadily increasing. They are required to supply a wider choice of products, higher quality and more convenient packaging at ever more competitive prices. Increased product diversification means smaller volumes of each product. In turn, this demands greater equipment flexibility and plant designs that minimize product losses and downtime when products are changed. From a plant operation perspective, better product quality means avoiding over-processing. Gentler product treatment is promoted by process control, which allows close monitoring and control of operating parameters, and careful equipment design. To supply products at competitive prices requires cost-effective operation. High energy recovery that reduces heating and cooling costs and decreased product losses in the plant are two major ways to reduce operating costs. Together with reducing waste from cleaning procedures, these measures also minimize environmental impact. High-acid products put different demands on processing equipment compared to low-acid products like milk. Consideration must be given to the fact that fruit juices differ in viscosity and often contain particles (pulp). For both aseptic products and non-aseptic (chilled) products with long shelf life (>20 days), high hygiene standards and safety measures are applied to the pasteurization process and downstream equipment to prevent any microbiological recontamination of the product. The juice packing plant is normally designed to process and package a range of fruit juices and juice-based still drinks. The equipment described in this section is not only used for processing orange juice. However, comments made regarding equipment requirements and performance relate to orange juice. The process line, from raw material reception to product reaching the filler, involves a number of steps. The steps required depend on the type of raw material and product to be produced. 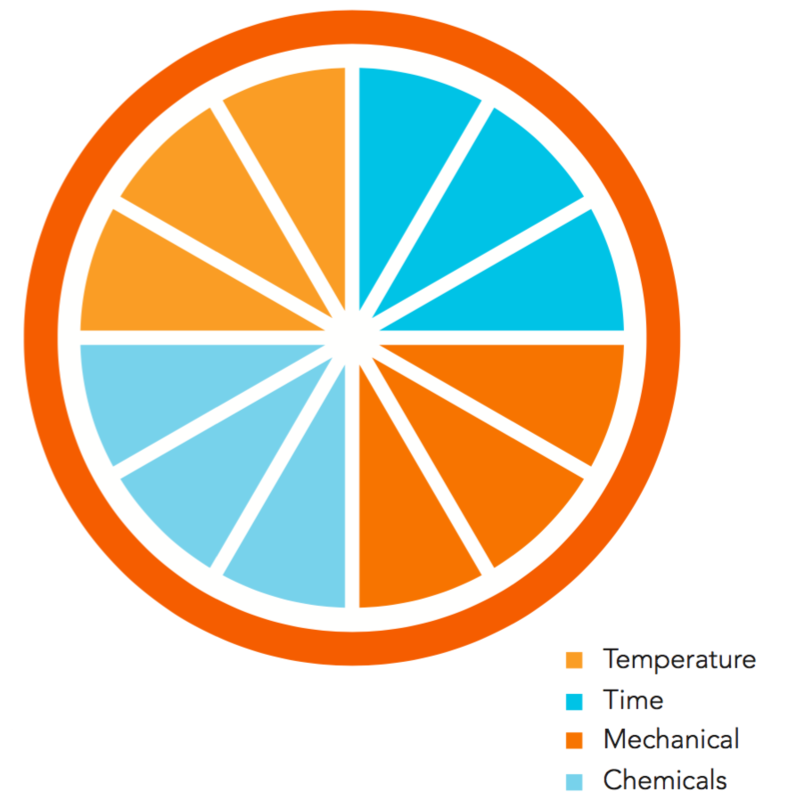 Figure 7.2 illustrates the process steps for production of orange juice starting from frozen orange concentrate as raw material (lines 1 and 2). Ingredient preparation for the production of orange nectar and fruit drinks is also included. In lines 3 and 4, (Figure 7.3) the raw material is NFC. Concentrate received in road tankers is pumped into large storage tanks. The storage area is refrigerated or the tanks are fitted with cooling jackets. The concentrate should be kept at less than 0 °C. Concentrate received in drums is placed in frozen storage. From the storage tanks, concentrate is pumped directly to the blending area for reconstitution with water. Alternatively, blending of concentrates from different origins or fruit types takes place in a separate tank prior to dilution with water. Concentrate in drums is warmed up to -5 °C or higher before it is poured or pumped out. The treatment required for product water used to dilute concentrate to final product depends on the quality of the water supplied to the plant. Common treatment methods include sand filtration to remove insoluble solids, active carbon filtration to remove colour, and membrane filtration to reduce dissolved salts (and organic matter). Ion exchange techniques may be used to soften the water or reduce its alkalinity. Plants with high water consumption, for instance during start-up and cleaning cycles, route treated product water to a buffer tank to ensure sufficient supply. The reconstitution step, referred to as the blending step, is carried out batchwise in line 1. The concentrate is diluted with water in large agitated tanks. A batch is prepared in one tank while product is pumped from another tank to pasteurization after sampling to check Brix value. Pulp slurry (and sugar solution for nectars and fruit drinks) are added in the batch tank along with the concentrate. Other ingredients may be added directly to the batch tank but are often prepared as a pre-blended mixture in the drink preparation area. In line 2, treated water and concentrate (and other ingredients) are fed continuously to the in-line blending system and mixed en route to the pasteurizer. The critical parameter, usually Brix of the final product, is monitored constantly. The control system adjusts flow rates of the respective components to maintain the target Brix value. The total flow of blended product, routed via a buffer tank, is adjusted to suit pasteurization capacity. In the pasteurizer, juice is heated in tubular or plate heat exchangers to pasteurization temperature (80- 95°C), which is maintained as the product passes through the holding cell. The juice is then cooled to filling temperature and routed to the filler. A deaerator removes free air and dissolved oxygen from the juice. Most of the heat used is recovered from cooling pasteurized juice. Additional energy is supplied by circulating hot water heated by steam. During cleaning, start-up and any operating failure, the flow is recirculated over the pasteurizer. In most cases, pasteurized product goes directly to the filler, from where any overflow is returned to the pasteurizer. A buffer tank between pasteurizer and filler ensures that variations in filler operation do not affect upstream processing and that continuous adjustment of pressure and flow can be made to suit the filling capacity. Buffer capacity is required for certain filler types. The buffer tanks should be of aseptic design to avoid microbial recontamination of product. One pasteurizer system can feed product to one or several filling machines. The same type of pasteurizer yielding commercially sterile product is used for both aseptically filled juices and non-aseptic juices intended for long shelf life under chilled conditions. A different pasteurizer design is used for hot filling. Sugar supplied to a plant in liquid form can go directly to on-site buffer storage, whereas granular sugar has to be dissolved in water to obtain a solution of specified Brix content. Small quantities of ingredients for the production of nectars and fruit drinks may be premixed before routed to the blending section. Sugar dissolving and ingredient mixing are usually carried out batchwise. Effective cleaning of all process line equipment is essential for good operational results. The cleaning unit supplies the required solutions and controls the cleaning sequences. A large central unit may clean the whole plant, or there may be locally placed units for cleaning different parts of the line. Operators control individual processing units via panels located near the equipment or from a central control room where the whole process line is supervised. The automation system may supply online information to management along with regular reports and may be directly linked to the production scheduling department. Processing lines using not-from-concentrate (NFC) as raw material are shown in lines 3 and 4. Frozen NFC, usually in 200 litre drums, is stored at -18°C. Aseptic bulk NFC, typically in aseptic storage tanks or aseptic bag-in-box containers, is stored at 0°C or higher. Solid frozen NFC is liquefied before processing. Rapid thawing is achieved by initial heating in a tunnel followed by tipping the drum contents into an ice-crusher. The ice slurry is then melted in a tubular heater. Juice in tanks and aseptic bags is liquid and can be pumped directly to buffer tanks. Aseptic bags are emptied via a hose pump inserted into the top of the bag or using a pump connected to the emptying spout at the bottom of the bag. Liquid NFC goes to buffer tanks. Here, juice of different origins may be blended and pulp added. Pasteurization and other downstream processing steps are carried out in the same way shown in lines 1 and 2 for reconstituted juice. A certain on-site stock of raw materials is required to ensure smooth production and avoid unplanned stops. Stocks are generally kept as small as possible to minimize storage space and inventory capital. However, stocks are also used to take advantage of market conditions when changes in supply prices are forecast. Raw materials arrive in several different forms. Concentrate for high-volume production arrives by road tanker. Other raw materials may arrive in frozen drums and aseptic bag-in-box containers. Specialty and add-back products come in various smaller containers, such as drums, boxes and cans. Sugar – used for production of nectars and juice drinks – is delivered in granular form or as a liquid solution. Regular sampling and lab analysis is performed to verify that incoming raw materials meet agreed specifications. Such routine checks for orange concentrate are described in Table 7.1. Authenticity checks to ensure product origin are carried out as deemed necessary. Analyses to control product authenticity are quite elaborate and require sophisticated analytical equipment (see also section 11). Concentrate arriving in refrigerated road tankers is pumped directly to storage tanks (20-50 m3) located in a refrigerated area. The refrigerated area is preferably maintained at -5°C to 0°C, although this is not always the case. The maximum storage period depends on the actual refrigeration temperature. There should be no significant increase in the microbial load of the concentrate during on-site storage. As an alternative to standard tanks stored under refrigeration, individual storage tanks may be fitted with double walls and a coolant flowing in the jacket. Microbial growth in orange concentrate is slow due to the high sugar content (high osmotic pressure). Basically, no microbial growth occurs in concentrates of 66 °Brix at temperatures below 0°C. However, a liquid layer of low sugar concentration may form on top of the concentrate inside the storage tank due to condensation of water vapour on the cold product. If this leads to microbial problems, a UV lamp can be installed in the top of the tank to inactivate microorganisms. The concentrate tanks, which are vented, are equipped with slow and gentle agitators to avoid layering of product. For relatively short on-site storage periods, the concentrate tanks are not always equipped with nitrogen blankets. However, measures should be taken to prevent air from being mixed into the concentrate during agitation or tank emptying. Concentrate is pumped from storage tanks to the blending area, typically using positive displacement pumps. Concentrate at low temperatures is very viscous. The fitting of valves between the tank and pump is therefore avoided as these cause high pressure drops. Pipe routing for product transfers made in the concentrate room is usually carried out manually using swing bend panels or flexible hoses. Automated routing systems are not common because of the large number of routing options and the desire to avoid valves in concentrate lines. Water flushing and cleaning-in-place of the concentrate lines are carried out less frequently than in the downstream part of the plant. This is because good operating routines combined with the high Brix values and low temperature of the concentrate hinder microbial growth. Moreover, the water/concentrate interphase during flushing and potential residual pockets of liquid at low Brix values provide suitable conditions for spoilage organisms to multiply rapidly. The water from flushing is collected in separate tanks for use in juice product reconstitution. Product frozen in 200 litre drums (typically frozen concentrate, NFC and pulp) is placed in frozen storage at -18°C or lower. As FCOJ at -18°C is virtually unpumpable, its temperature is raised to about -5°C or higher at the time of use. Several techniques are used for this, including placement of a hot jacket round the drum, hot air circulation, or simply leaving the drum in a non-refrigerated area. The preferred method depends on daily production volume and how much advanced notice is received from scheduling. Concentrate is either pumped out of a drum using a submersible hose pump or emptied into an open vessel connected to a discharge pump (the latter being a quicker method). The concentrate flows either directly to the dilution tanks for blending with water or to a concentrate buffer tank for mixing with other concentrate(s). Residual product remaining inside the bag is recovered by mangling the plastic bag or rinsing it with water. The dilute product is then added to the blending tanks. Raw products such as NFC, pulp and concentrates of lower Brix freeze solid at -18°C. They are prepared for processing by placing them to thaw in a non-refrigerated area or by using a system for quick thawing and crushing. Figure 7.4 shows the principal steps forrapid thawing of frozen product. The drum passes through a hot air tunnel to allow the outer layer of the product to melt. The drum contents are then emptied into a vessel fitted with rotating knives that chop the frozen product into a slurry of ice. The slurry then passes through a tubular heater to melt. The liquid product is collected in a buffer tank. A quick-thawing line can process a large number of drums per hour (up to 60 drums per hour equivalent to 10,000 l/h of product). As hot air and steam are used to heat and melt the ice, it is an energy-intensive system that also requires significant investment. Juice packing plants that receive only a limited amount of frozen product in drums have often developed their own less costly solutions for thawing. 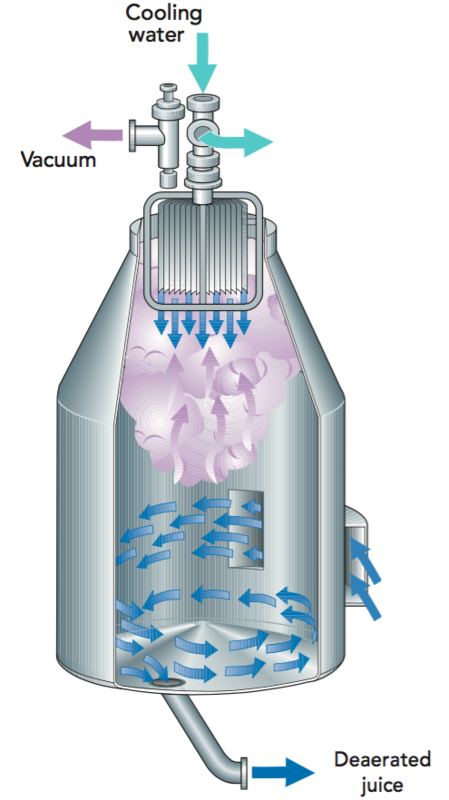 Partial thawing of the drum contents at ambient temperature is followed by crushing using a smaller “chopper” before the slurry is added to the blending tank. This method must be carefully monitored due to the risk of microbial growth while the juice or pulp slowly thaws at ambient temperature. Orange concentrate in aseptic bag-in-box containers (200 litre drums) is placed in cold or frozen storage on site. Long-term storage should be at a maximum of 5°C to limit quality degradation. When required for processing, concentrate is pumped from bags in a similar way to FCOJ in drums (see subsection 7.2.2). Aseptic bags are seldom used for orange concentrate, but large volumes of NFC are stored and transported in aseptic bags – typically in volumes of about 1,000 litre (300 gallon) juice per bag. Manually with a hose pump inserted through the filling spout or through a cut at the top of the bag. to an emptying spout at the bottom of the bag. This may reduce the product’s exposure to air. Aseptic withdrawal of juice through an aseptic connection to the emptying spout. If this is followed by aseptic transfer, the juice does not require repasteurization prior to packaging. After emptying, NFC is sent to a buffer tank prior to pasteurization. NFC of different origins may be blended here. NFC may also be delivered to the juice packer by refrigerated road tanker. The juice comes either from a blending house (after preparation by crushing) or from aseptic storage tanks at a juice processing plant or a reception terminal. Transport in road tankers is done under hygienic but not aseptic conditions. On arrival at the juice packer, NFC should be kept in refrigerated tank storage at 0-4°C for a limited time before blending, pasteurization and filling consumer packages. Although reclaim, or rework, product is not a raw material supplied to the gate of the juice packing plant, it is still used as a basic ingredient in juice production. The reclaim “juice” is too valuable to be sent to drain. It has incurred costs in the form of raw material, import duty, freight charges and processing up to the point of collection. Moreover, its discharge as effluent would not be acceptable for environmental reasons. As far as possible the reject product is used to produce the same type of juice as it was collected from. This, however, is not always possible for products demanding strict quality specifications. In this case, the reclaimed juice is used in orange products not intended as premium brands, or in the manufacture of multi-fruit juices and fruit drinks. Operating procedures and equipment design in the juice packing plant should aim to minimize reclaim volumes. Rework product not only entails reprocessing costs but also often ends up yielding a final product of lower value than originally intended. Water is the largest ingredient in reconstituted orange juice and orange-based drinks, corresponding to 80- 85% of the final juice. The quality of reconstitution water significantly influences the final product. The water removed from the juice when it is concentrated is effectively distilled or “pure” water. But distilled water is not normally used for reconstitution. Water from municipal supplies or from private wells normally needs further on-site treatment to make it suitable for reconstitution of good quality juices. There are no regulatory standards specifying water quality for beverage production other than that it should fulfil national drinking water standards or the requirements of the UN-run World Health Organization (WHO). Council Directive 98/83/ EC legislates on water quality for human consumption in the European Union. However, even though water may be of acceptable drinking quality, it may still not be acceptable as reconstitution water if it has the potential to cause off-flavours, for example, in reconstituted juice. Table 7.2 lists various recommended specifications for water used in beverage production (also referred to as product water). The effects of various water impurities on juice quality are discussed in subsection 4.1.1. Water hardness is an important quality parameter. It is caused by dissolved calcium and magnesium salts. Temporary hardness results from calcium and magnesium bicarbonates; permanent hardness results from chlorides and sulphates. Total hardness, the sum of temporary and permanent hardness, may be expressed in different ways. In North America it is expressed as calcium carbonate (CaCO3) in water, that is, the concentration of different salts calculated as the corresponding quantity of CaCO3. In Europe the expression “degrees German hardness” (°dH) is commonly used along with °f (France). East European countries often use the concentration of ions in water (expressed as meq/l). In everyday language, water hardness is simply described as soft or hard water. However, soft-to-hard scales vary between countries. Typical ranges expressed in different units are given in Table 7.3. Water for juice production should be soft, <6 °dH. The ranges for soft and hard water may vary between different geographic regions. Several common water treatment methods are described below. Some treatments such as ion exchange, reverse osmosis and nanofiltration techniques may be used on a partial stream followed by blending with the rest of the water stream to achieve the desired water quality parameters. Figure 7.5 shows a combination of treatment steps for product water. Depending on water quality and juice packer preference, several alternative combinations may be applied. Flocculation is a method for removing suspended particles, such as organic matter and humic acids, from water. The addition of appropriate chemicals (flocculants) to incoming water aggregates the particles to form flocs that settle on the bottom of the reaction tank. Commonly used flocculants are aluminium sulphate and iron sulphate. Flocculation is normally not needed for a municipal water supply because organic matter has already been removed in the municipal waterworks. This involves passing water through a sand filter held in a tank to remove insoluble solids. 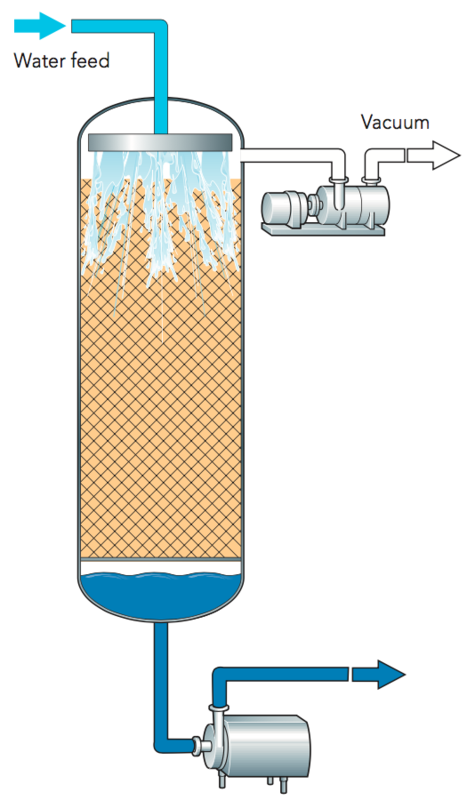 A sand filter consists of several layers of sand of varying coarseness. It may be used for final filtering after flocculation or iron-manganese oxidation. Under appropriate conditions, iron compounds in water form flocs when oxidized by air. The flocs are subsequently removed in a sand filter. Manganese and iron compounds are removed by a combination of oxidation and filtration through a sand filter with a manganese-treated filter bed. The latter is regenerated by potassium permanganate. A method used to reduce the alkalinity of water. This may be required because high alkalinity neutralizes fruit juice acidity. The presence of carbonates and hydroxides of elements like calcium and magnesium makes water alkaline (pH>7). These are removed by an ion exchange process. When water is passed through a resin bed (consisting of small beads of appropriate polymer) the calcium and magnesium ions attach to the resin and water and carbon dioxide are produced. Reducing alkalinity also reduces water hardness. In this method, calcium and magnesium ions are replaced by sodium ions by passing water through a bed of resin in a similar way to dealkalization. The hardness of the softened water is virtually zero. Often only part of the water is softened so that when it is re-blended with the main water stream the desired hardness is obtained. A membrane filtration system for removing small dissolved molecules including salts. It produces virtually pure water (>95% of dissolved salts and >99% of organic matter are removed). Despite higher costs, the reverse osmosis method, which also reduces bicarbonate content, is sometimes preferred to dealkalization by ion exchange. Chlorine is the most widely used sterilant for water. Nevertheless, it should not be added to water containing humic organic matter because this reacts with chlorine to form trihalomethanes (THMs). Chlorine is most efficient as a disinfectant at pH<4. Because it reacts with several substances in water, sufficient chlorine must be added to ensure enough is available to destroy any microorganisms. The chlorination step must be followed by the removal of residual chlorine. Chlorination is normally not needed for municipal water. However, residual chlorine left in the water should be removed as it will otherwise react with orange flavour and give reconstituted juice a flat taste. Activated carbon is a highly porous material with a very high adsorbent capacity. Filtering water through activated carbon removes colour and odour. When there is a risk of microbial contamination of filters, UV treatment of the outlet flow is recommended as a safeguard. 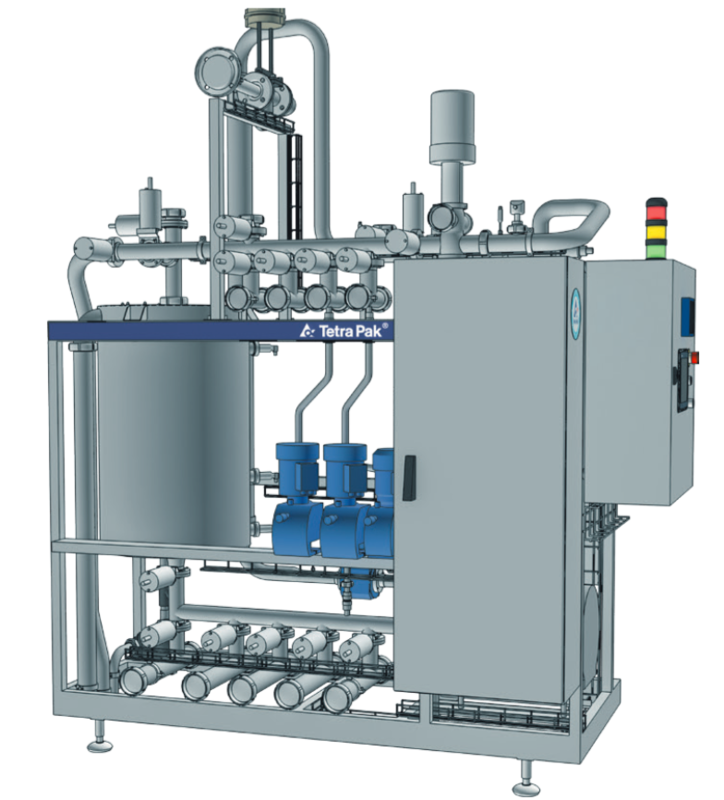 An alternative is to equip the filters for steam sterilization, though this makes the filter system considerably more complex and raises the investment cost. Chlorine adsorbed to the active carbon is regenerated during steam sterilization. Passing water under ultraviolet (UV) light is a method used to destroy microorganisms in water. It is a relatively simple technique with low energy consumption. UV light effectively kills microorganisms, but UV radiation is impeded by insoluble material in water. It should therefore only be applied to clarified water. A method of water sterilization using ozone gas. Because ozone is a very strong oxidizing agent, it can be used to remove off-taste, colour and iron and manganese compounds. Ozone is generated on-site from air. The operation includes converting residual ozone gas to oxygen by heat, activated carbon or UV light. Safety filters used for incoming water to protect downstream equipment. They are typically bag or cartridge filters of 5-10 μm pore size. Product water is distributed through pipes from the water treatment section to the point of use in the plant. Short but intensive periods of water usage may occur simultaneously at several outlet points, exceeding the output from the water treatment plant. Buffer storage of treated water is therefore recommended at a volume typically corresponding to two hours’ water production. It is advisable to recirculate water in the storage tank through a UV disinfectant unit to limit bacterial growth. The water distribution system must be capable of handling high water consumption peaks while maintaining high water supply pressure. An increase in production capacity at the juice packing plant may render the water distribution system inadequate. In this case, a pressurized tank of a few m3 can overcome the problem of supply pressure drops during periods of peak water consumption. The amount of air – or more precisely the oxygen content – in water greatly influences the oxygen content of reconstituted juice. Treated product water may contain both free and dissolved air. Free air (bubbles) may be released by holding the water in a buffer tank for a specific time, but removal of dissolved oxygen requires a deaeration process. Dissolved oxygen levels in cold water are typically 10-12 ppm, depending on temperature and pressure. The solubility of oxygen in water is shown in subsection 4.2. Provided that the concentrate has been handled carefully (without admixing air) and that blending with water is done in the absence of air, reconstitution with deaerated water results in a packaged juice with very low oxygen content. Several different water deaeration systems exist for preheated water or water at ambient temperature. 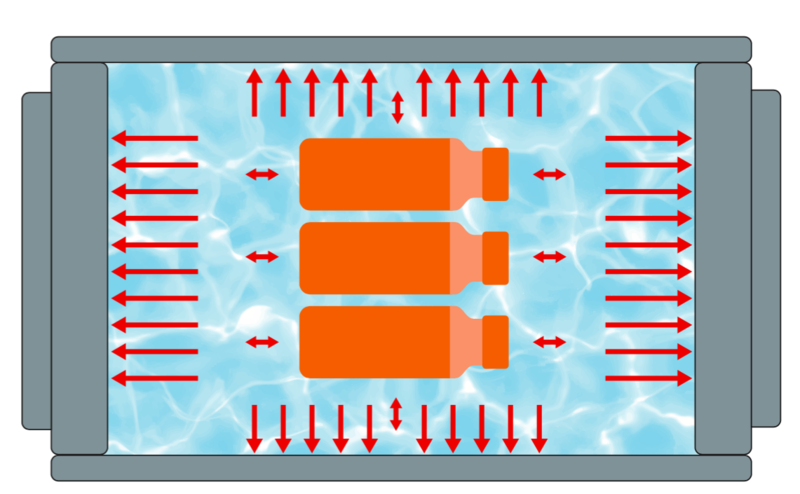 Figure 7.6 illustrates a deaeration system working under vacuum and suitable for both preheated water and water at ambient temperature. Water passes down through a column with a packed bed and spreads out in a thin film over the extensive surface area of the packing. The large contact area between water and vapour phase makes it easier for the dissolved oxygen to leave the water. Dissolved oxygen in the outgoing water is about 0.5 ppm. Water deaeration is common practice in breweries and carbonated soft-drink production as it facilitates the subsequent carbonation step. It is not yet so common in juice production, where juice deaerators dominate. In juice packing plants today, the equipment used upstream of pasteurization often allows the product to come into contact with air, thus reintroducing oxygen into already-deaerated product. In the context used here, the term “blending” means the actual reconstitution step whereby concentrate is blended with water to make a ready-to-drink juice. Blending takes place just prior to pasteurization. everal different concentrates can be premixed prior to the blending step or can be added to the blending tank (in the case of batch blending). When oil fractions are added at site, they should be thoroughly mixed into the concentrate prior to the blending step. Alternatively, they can be prepared as a water-oil emulsion added in the blending step. Moreover, pulp and water-soluble flavours may be added in the blending step. As the name implies, NFC is not diluted with water, though NFC with different characteristics is often blended before pasteurization. Essence aroma may also be added to NFC at this stage if legally permitted. If the end-product is a nectar or fruit drink, other ingredients are added in the blending step. When sugar is added to orange juice it may no longer be called juice but becomes a fruit nectar. Regulations stipulate what may be added to fruit nectars. For example, EU Council Directive 2001/ 112/EC defines fruit nectars as fruit juice to which water and sugar have been added. The fruit juice can be as juice, concentrate or powder, and honey or sweetener may be substituted for sugar. Minimum juice contents are specified for each type of fruit, which for orange nectar in Europe is 50%. Stabilizers used to maintain product consistency include pectin and guar gum. Preservatives used include benzoic acid, sorbic acid and sulphur dioxide. Antioxidants include ascorbic acid and sulphur oxide. For orange drinks with low juice content, acid needs to be added. Brix level and Brix/acid ratio are typically higher for nectars and drinks compared to pure juice. Preservatives are not required when the product is pasteurized and aseptically packed. Several ingredients for drinks (and nectars) are added in very small quantities. They may be added directly to the blending tanks or, preferably, a premix of these ingredients is prepared separately. Dissolving granulated sugar to give a sugar solution of defined concentration is often done at the juice packing plant. Sugar may be dissolved batchwise or continuously. Alternatively, sugar may arrive as a liquid solution by road tanker and pumped to storage tanks on site. The choice depends on the amount of sugar used and proximity to sugar suppliers. The Brix value of the reconstituted juice is the key parameter for the blending operation. Appropriate regulations stipulate minimum concentrations of soluble solids for reconstituted juice. The EU demands a minimum value of 11.2 °Brix for orange juice made from concentrate, while the US sets a minimum value of 11.8 °Brix. Brix is measured by a refractometer and is corrected for temperature and also for acid content for concentrates. Brix can also be measured with a density meter. The required hourly output from the blending section is determined by the downstream filling rate and the total volume of juice to be packaged. The quantities of concentrate and water to be blended can be estimated from the Brix of the concentrate and of the final product. A calculation example is shown in the fact box. Juice of 11.2 °Brix has a specific gravity of approx. 1.045 kg/l. In other words, 1 litre juice at 20°C weighs about 1045 grams. 1,045 x 11.2/100 = 117 grams soluble solids. 1 kg concentrate of 65 °Brix contains 1,000 x 65/100 = 650 grams soluble solids. These values are approximate because juice is not a pure sugar solution. In practice, density values are approximate for orange juice because it is not a pure sugar solution but contains varying quantities of insoluble solids and acid. The actual Brix value of concentrate may differ from the specification by, say, ±0.5 °Brix. Hence, in the case of orange juice, the exact Brix of the final juice cannot be calculated from a formula. For high accuracy, it must be determined by laboratory or inline measurements. The stipulated Brix concentrations for reconstituted juice are minimum levels, so actual levels must not fall below the stipulated number. To allow for variations and inaccuracies in commercial production plants, the target Brix for juice from the blending room is set slightly higher than the official minimum. The necessary “safety margin” depends on the accuracy of the blending operation. Blending as close as possible to the stipulated Brix saves a significant amount of raw material. Process control equipment and blending system design may improve blending accuracy. An estimate of the savings involved is shown in the fact box. A reduction by 0.1 °Brix, e.g. from 11.35 °Brix to 11.25 °Brix, gives a reduction in raw material consumption of 0.1 °Brix/11.35 °Brix = 0.9%. 42,000 x 0.1 °Brix/65 °Brix = 65 tonnes equal to a value of 227,000 USD. Tank blending, or batch blending, is the traditional method and is carried out manually or with the help of automation systems. In-line blending systems, which are more recent, incorporate a high degree of automation and process control. Preparation in advance: As blending a batch typically requires 1-2 hours’ preparation, blending room personnel need to arrive early to complete the first batch before the start of daily production. Fixed volume production: It is difficult to prepare exactly a predetermined batch volume. Attempting to do so may result in insufficient juice volume for packaging or juice left over after the production run, for which an alternative use must be found in the plant. Labour-intensive: Manual or semi-automatic blending requires the frequent attendance of blending room personnel. Variation of Brix concentration: Achieving a level close to the target Brix for the blended juice usually requires several laboratory Brix measurements followed by water additions to the blending tank. In practice, however, a shortage of time and/or labour may prevent the standard routine of repeated Brix checks from being carried out. Low investment: Manual and semi-automatic tank blending systems require a comparatively low investment. Additional raw materials may be added without the need for further equipment. Labour-saving: No advanced preparation, automatic flow control and continuous in-line Brix measurements free up personnel for other duties. Variable juice volumes: Blending is carried out to the exact juice volumes required. Consistent accuracy: Process control and in-line Brix monitoring maintain consistent measurement accuracy close to the target Brix value. Compact equipment: In-line blending requires less space by eliminating the need for large tanks for blending product. Moreover, less product is lost during CIP. Small volumes of blended product: In-line blending minimizes the product volume exposed to risk of disruptions such as power failure. Less and more compact equipment and short residence times reduce the risk of microbial contamination. No exposure to air: Closed in-line blending systems avoid exposing the product to air. Less concentrate usage: Blending closer to minimum Brix levels and no excess product left in tanks after a production run result in lower concentrate consumption. High investment: Automatic systems for in-line blending require a relatively high investment, particularly when many separate ingredients have to be blended. Batch blending is best suited to small production runs and/or many ingredients, as is the case with specialty beverages. In-line blending is best suited to large volumes of products requiring few ingredients, for example high-turnover consumer products like pure juices. A combination of the two blending principles may be applied to fruit nectars and fruit drinks containing several ingredients. The smaller-quantity ingredients are pre-mixed batchwise and the pre-mix is blended in-line with water and juice concentrate. The two blending principles involve different features. Each batch blending line incorporates two blending tanks. While one tank is used to prepare a new batch, juice is pumped from the other tank to the downstream pasteurizer. Both tanks are equipped with agitators for effective ingredient mixing. However, agitation should be carried out in such a way as to avoid entrainment of air into the juice as this can cause operational problems in downstream processing. Efficient tank cleaning-in-place is also important to prevent microbial contamination of juice for the next production run. In a manual system, the quantities of concentrate and water (plus any other ingredients) required for a batch are calculated. First, a predetermined quantity of water (majority of the calculated volume) is fed into the blending tank followed by concentrate. Concentrate volume is often measured as the number of drums. Other ingredients, including flushing water from drum rinsing, are then added to the tank. The Brix concentration of reconstituted juice is checked after thorough mixing in the tank. More water is then added to get nearer the target Brix level. When the desired Brix has been reached, the product is ready for pasteurization. Changeover to the full tank takes place when the other tank becomes empty. Product is pumped from the full tank to the pasteurizer section. In semi-automatic batch blending systems, recipes are preprogrammed in a process control unit. When a recipe is selected, together with relevant data for the production run in question, the control unit calculates the quantities of ingredients to be blended. The addition of water and concentrate (and perhaps syrup) is automatic and controlled through weighing the tank contents (by load cells in the tank legs) or by mass flow meters. Sampling to check Brix levels is done manually. The measured Brix level is entered in the controller and the water volume needed to make the correct adjustment to the tank contents is calculated and the water then added. After thorough mixing, Brix is again checked manually and further adjustments are made to the tank contents if necessary. In a fully automatic tank batch blending system, an in-line Brix meter continually monitors the concentration of blended product. Adjustments are then calculated and carried out through the control system. The in-line Brix sensor is placed in a circulation loop over the tank to ensure that the sample is representative of the tank contents. 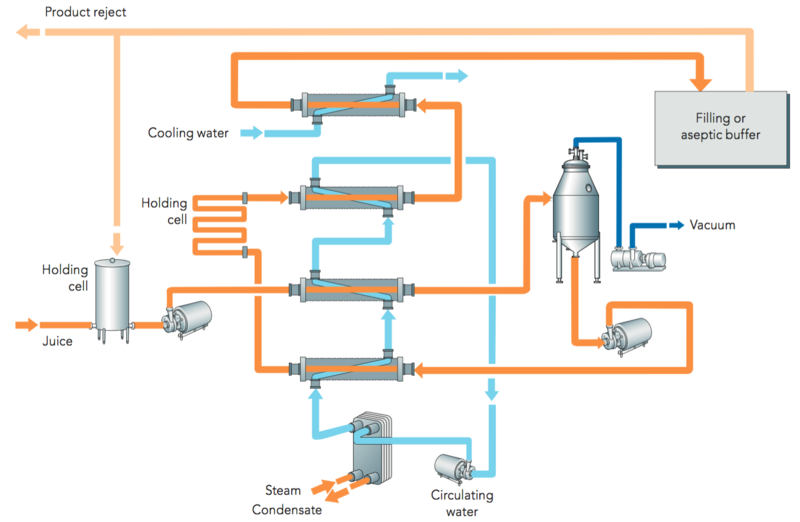 Figure 7.7 shows the operational principle of a batch blending system. Semi-automatic systems are widely used for batch blending, but fully automatic systems – which require significantly higher investment – are less common. The operational principle behind in-line blending is that the ingredients are continuously fed and mixed in-line on the way to pasteurization. In-line blending based solely on volumetric measurements achieves limited blending accuracy. This is due to variations in concentrate density and Brix caused, for example, by air bubbles trapped in the viscous concentrate and Brix variations of the concentrate in the tank. Volumetric blending, for example with piston pumps, therefore must be combined with an exact Brix measurement system for the blended juice to ensure high blending accuracy. Mass flow meters, which are highly accurate, measure both mass flow and actual density of the ingredient streams. The Brix value of final juice is calculated from the ratio of the two flows. For FCOJ, however, flow meters are deliberately over-dimensioned to avoid excessive pressure drops on the very viscous fluid. In this case, the flow meters may be less accurate as they operate outside their optimal flow range. In-line Brix measurement of blended product by refractometry is a direct measurement of the final juice. As it is the same as the measurement method specified for the final product, it avoids deviations caused by inaccurate conversion factors. If, however, the in-line analyzer is a density meter, which gives higher accuracy, and the lab analyzer is a refractometer (common in a juice plant) there is a slight difference between the measured Brix values due to citric acid and aroma content. This deviation is adjusted to zero by using a correction factor in the in-line density meter. FCOJ from cold storage is very viscous and does not mix easily with water, so effective in-line mixers are required to obtain a homogenous mix. Figure 7.8 illustrates an in-line blending system for two streams. A water stream and a pre-mixed concentrate stream are blended and transferred to a buffer tank. The total flow rate through the blending unit varies to match the throughput of the downstream filling machine, but the ratio between water and concentrate is kept constant. The buffer tank is fitted with an agitator to ensure the blend is homogeneous and a mass flow meter is placed in a circulation loop over the tank to check that the Brix of the blended juice is on target. Mass flow meters measure flow and density in each stream. A change in concentrate density (that is, Brix) leads instantly to adjustment of the blending ratio, ensuring that the Brix of blended juice is always on specification. Reclaimed product and mix-phases (of product and water) generated at production start and finish can be re-introduced into the blending unit to avoid valuable product being lost. The measuring unit of a refractometer has three main components: light source, prism and image detector. The measuring unit illustrated in Figure 7.9 detects the critical angle of light. The light source directs light rays through the prism into the liquid. 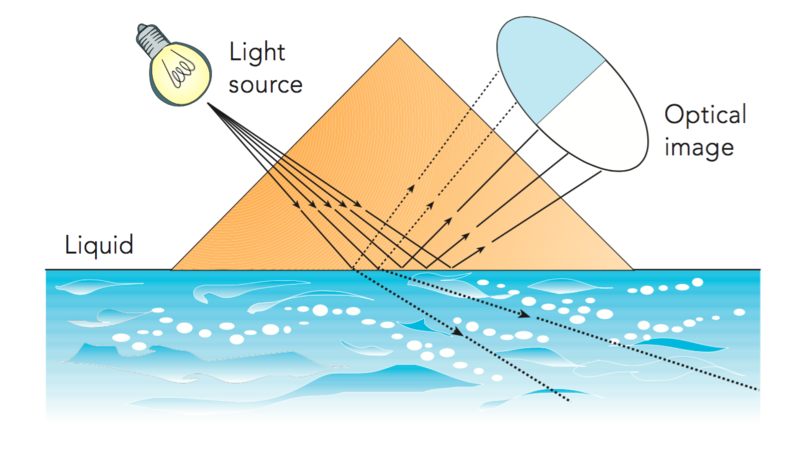 The light rays meet the liquid surface at different angles. Rays with a steep angle are partly reflected to the detector and partly reflected to the liquid. Rays with a gentle angle are totally reflected to the image detector. The angle at which the total reflection starts is called the critical angle. The critical angle is determined from the borderline between the light and dark areas on the detector, which corresponds to the refractive index. The measured value, expressed as °Brix, must be corrected for temperature. This is often done automatically by a temperature sensor in the instrument. The measurement accuracy depends on the instrument’s sensitivity. Advanced refractometers for use in a controlled laboratory environment are far more accurate than hand-held units used for quick checks in the plant. Refractometers placed in-line in a process are calibrated against laboratory refractometers. High accuracy of the latter is therefore important. As density depends on temperature, a measured density must be stated with the surrounding temperature. Compensation to express density values at a reference temperature (usually 20oC) is necessary to allow comparison of measurements taken at different temperatures. There is a correlation between density and sugar concentration, or Brix. The relationship density/Brix for sugar solutions has been determined and published. One common method of measuring a liquid’s density is to feed the sample through an oscillating tube. When the liquid enters the tube, oscillation frequency decreases and density can be calculated from the difference in oscillation between the empty and full tube. Temperature and density signals from the density meter are used in a calculation to express density values at the reference temperature. Density meters are generally more accurate than refractometers. Although density meters are frequently used to measure Brix in carbonated soft drink production, they are as yet not commonly used in the juice industry. For orange juice, a correction factor is required when converting density measurements to Brix values to compensate for solids other than sugars in the juice (see section 12). Juice packers pasteurize reconstituted juice and NFC to destroy any microorganisms that have entered the concentrate or NFC after heat treatment(s) earlier in the production chain. Enzymes in the juice were inactivated by the first heat treatment at the fruit processor’s plant. General aspects of microbiology and pasteurization are discussed in subsections 4.3 and 4.4 respectively. It is recommended that juice intended for non-aseptic packaging, chilled distribution and long shelf life (>20 days) is commercially sterile when it leaves the pasteurization process. It should therefore be processed in the same equipment and under the same hygiene conditions as juice to be filled aseptically. However, the combination of temperature and residence time may be set closer to the theoretical minimum level – that is, a lower safety margin to cater for raw material variations. Conversely, a misconception sometimes exists in the industry that juice for aseptic filling requires considerably more heat load than chilled (non-aseptic) juice. Orange juice, along with other high-acid products, requires heat treatment of 80-95°C for 15-30 sec. to be made microbiologically stable for chilled storage or storage at ambient temperature. Ultra high temperature (UHT) is not required. The most important criterion for selecting pasteurization conditions is the microbial load of the juice to the pasteurizer. Plate and tubular heat exchangers are the most commonly used equipment for heat-treating juice (and other fruit drinks). Both types of heat exchanger enable good heat recovery, thus keeping down operating costs. 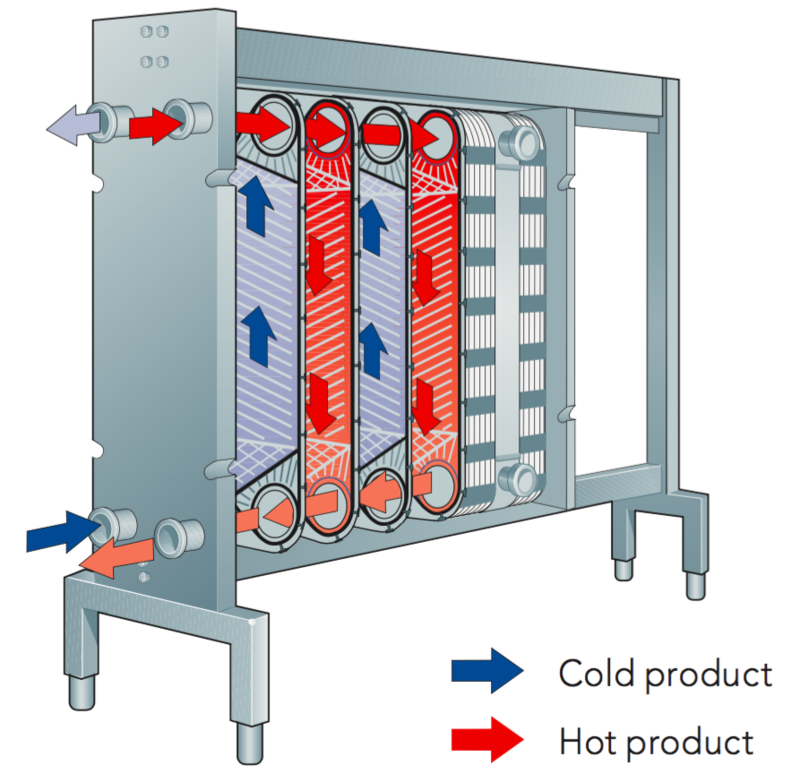 A plate heat exchanger consists of a series of stainless steel plates clamped together in a frame (see Figure 7.10). Product to be heated flows on one side of the plate while the heating medium usually flows in the opposite direction on the other side. The heating medium may be product being cooled or circulating hot water. Characteristic features of plate heat exchangers are compact design, high heat transfer rates, very high degree of heat recovery and low hold-up volumes. Plates are designed with different corrugation patterns. Patterns which result in few contact points between the plates yet cause good liquid turbulence are recommended for juices with a high content of suspended solids or containing short cells. This is important for effective cleaning-in-place and for preventing particles from sticking to the contact points. Such a plate is shown in Figure 7.11. For products with suspended solids, reversing the direction of flow (back-flushing) is recommended during cleaning. Multitube-type tubular heat exchangers are based on the classic shell and tube principle. The product flows through a group of parallel tubes and the heating (or cooling) medium flows between and around the tubes in the opposite direction. Both ends of the parallel tubes are welded into circular end plates that are sealed into the outer shell, usually with rubber O-rings. The tube end plate directs incoming liquid into the tubes. There are no obstructions or contact points for product within the tubes. 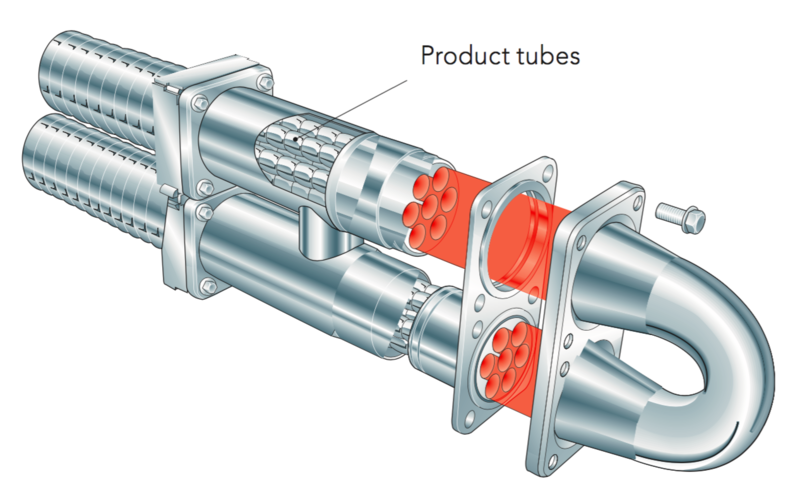 Figure 7.12 shows an example of a multitube heat exchanger, with a floating end design that allows for thermal expansion of the tubes. The tubes are corrugated to increase the heat transfer rate. Another type of tubular heat exchanger is the triple tube. This consists of three concentric tubes placed inside each other to form channels for the alternating flow of product and heating medium. Typically, product flows through the intermediate channel, while heating/cooling medium flows through the inner and outer channels. Tubular heat exchangers are commonly designed for indirect heat regeneration (as opposed to direct product-to-product heat regeneration) using a circulating water loop to transfer heat from hot to cold product. Characteristic features of tubular heat exchangers are their ability to handle juice with cells or other liquid foods containing particles, and their low fouling rate, which allows long production runs between CIP. Maintenance and service requirements of tubes are lower compared to other heat exchanger types because they have fewer seals and other parts that need replacement. The level of heat recovery is normally lower for tubular heat exchangers than for plate heat exchangers. For final heating of product to pasteurization temperature, it is possible to select a small temperature difference between product and heating media to avoid product overheating. This applies to both plate and tubular heat exchangers. The choice between plate and tubular heat exchangers depends on the properties of the product to be processed. Table 7.4 is a guideline for selecting the most suitable type of heat exchanger for a particular application. Generally, tubular heat exchangers are more versatile in application than plate heat exchangers, though they entail higher capital investment. In recent years tubular heat exchangers have become the preferred solution thanks to application flexibility and low service requirement. Although the heat exchanger is the heart of the pasteurizer, a balance tank, valves and pumps are required to build a properly operating pasteurizer system. Figure 7.13 illustrates a pasteurizer system and the juice flow through it. Juice from the blending room enters via the balance tank. This tank makes the pasteurization process independent of flow fluctuations in the upstream feed line and keeps the conditions in the pasteurizer stable. Circulation during start-up and pre-sterilization is through the balance tank. From the balance tank, juice is pumped to the heat exchanger. Here, it is heated by outgoing juice or a circulating water loop. An intermediate water loop, as shown in Figure 7.13, is used when there is no direct product-to-product heat recovery in the heat exchanger. Preheated juice then passes to the deaerator (if included in the pasteurization system). Deaerated juice is heated further to pasteurization temperature, typically 80-95°C. 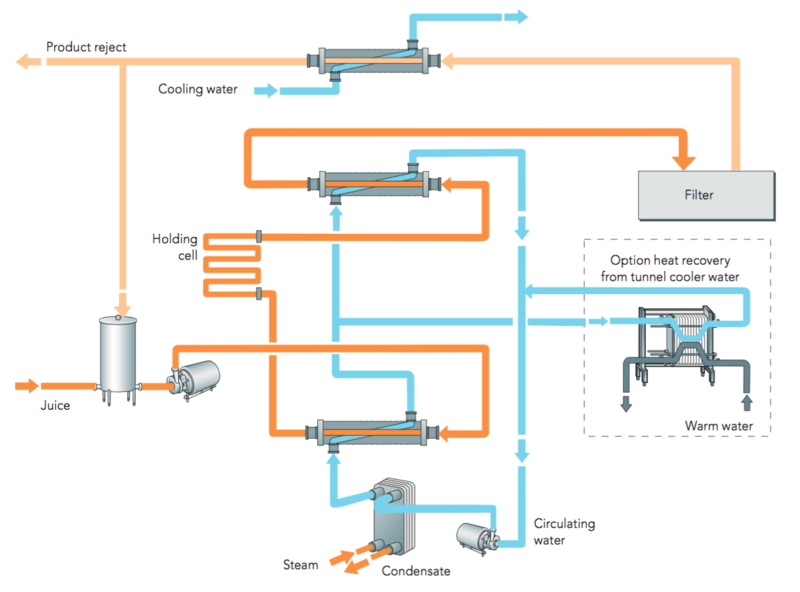 The additional energy needed – that not obtained by heat recovery from outgoing product – is supplied by steam. The steam heats hot circulating water in a separate heat exchanger. Hot water temperature must be maintained close to the juice pasteurization temperature to avoid overheating the product. It is not recommended to use steam directly in the juice heat exchanger as it creates product burn-on and temperature control difficulties. Juice at pasteurization temperature flows to the holding cell, which holds the juice at pasteurization temperature for a defined period, typically 15-30 seconds. The pasteurized juice then returns to the heat exchanger where it is cooled by regenerative heat transfer. Juice to be packed at ambient temperature then flows directly to the filler. 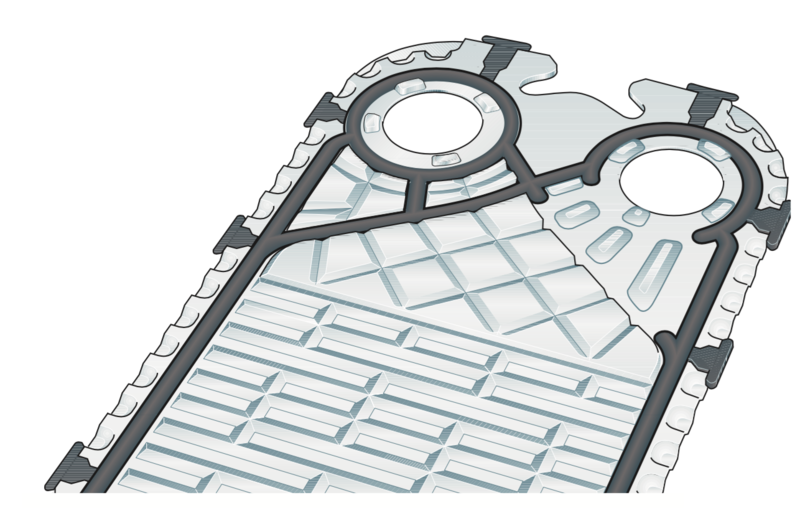 Juice for chilled distribution is first chilled by cooling water (or other coolant) in an additional heat exchanger section before being routed to the filler. The holding cell and all equipment downstream of it must be aseptic, meaning that it must not cause any microbiological recontamination of the juice. Equipment and controls therefore need to be designed accordingly. Prior to intake of product at the start of the production run, the pasteurizer system is pre-sterilized. During sterilization, water heated to 95-110°C is circulated through the system for 20-30 minutes. Where applicable, the circulating water is cooled to below 100°C as it returns to the balance tank. After the production run, residual juice is flushed out with water and the pasteurizer system cleaned in place. Detergent may be dosed into the balance tank and circulated through the pasteurizer or it may be connected to a central cleaning liquid supply source (see subsection 7.9). The regular cleaning routine, once every one to three days, should include a wash with a caustic or similar solution. Rinsing with a mild acid solution is typically done weekly. If floating cells (pulp) have been added, small air bubbles may also be adsorbed to the surface of the particles, thereby increasing the oxygen content further. As orange juice is sensitive to oxygen, it is recommended that a deaerator is included in the pasteurization process. Subsection 4.2 discusses the effects of oxygen on orange juice quality and deaerator operating principles. Deaeration of reconstituted juice is similar to deaeration of NFC. It is usually carried out by passing the product through a vacuum chamber. Free air bubbles expand under vacuum and tend to escape readily from the juice, whereas dissolved oxygen is more difficult to remove. Good deaeration efficiency (oxygen reduced to <1ppm) can be achieved using very short residence times provided that the juice is preheated to 50-60°C, which allows it to “flash” (some water boils off) in the vacuum chamber. Running the deaerator close to the flash point but without actual flashing results in a somewhat higher oxygen content, typically 2-3 ppm. Experience has shown that this level is often adequate to ensure good final product quality. Some volatile components in the juice will vaporize in the vacuum chamber, both with or without product flashing. Effective condensation of these volatiles and returning them to the juice are therefore important to avoid flavour losses. A vacuum chamber for a juice deaerator system with in-line aroma recovery is illustrated in Figure 7.14. The juice enters the vacuum vessel tangentially and is distributed as a thin film over a large surface area. As it enters the vacuum vessel, the product flashes and its temperature drops a few degrees. The pressure in the vacuum chamber, or the juice inlet temperature, is adjusted so that the inlet temperature is 2-5 °C above the boiling point of the juice at the actual pressure. Alternatively, if no product flash is desired, the inlet temperature is set at the boiling point. This fine-tuning may be carried out manually or, preferably, as part of the control system. Vapours are condensed by an internal condenser and returned to the liquid in the vessel without any time delay, ensuring consistent product quality throughout the run. Deaerated juice is pumped out of the bottom of the vessel carefully so as to avoid entrainment of gases from the vacuum chamber (oxygen) into the liquid. The pasteurizer may be assembled on-site or purchased as a pretested and preassembled frame-mounted unit, including all piping and control wiring, as shown in Figure 7.15. The latter choice is gaining ground due to its proven machine quality, particularly for highly automated systems. It shortens installation time and start up. A combination of field-proven engineering solutions and the continuous improvement of machine features is essential for the design of high-performance aseptic pasteurizer systems. The design requirements are much stricter than for conventional pasteurizers. The control system is one of the most important features of the pasteurizer system. Orange juice pasteurizers in operation today range from manually operated units to fully automatic systems. For systems supplying commercially sterile product, more advanced process control is required to minimize human error and equipment failure. Such systems, incorporating microprocessors or programmable logic controllers (PLCs), also take care of recipe handling, production sequencing, automatic valve switchover and the supply of management information. The benefits of PLC control include improved product quality and safety, high process repeatability, increased production efficiency and reduced labour costs. Frame-mounted pasteurizer units are typically equipped with a control panel with PLCs and an operator unit for manual input of data to the pasteurizer control system. The control system can also be connected to a central control room for remote communication. The effect of heat treatment on the destruction of microorganisms depends on the combination of temperature and time. With a longer residence time, a lower temperature level is sufficient to achieve the same microbial reduction (see subsection 4.4.4). Pasteurization Units, PU, are a way of correlating thermal effect with different time/temperature combinations. They are commonly used for tunnel pasteurization and in the brewing industry. One PU is defined as the thermal effect of holding the product for one minute at a defined reference temperature. In cases where the flow rate through the pasteurizer is reduced but pasteurization temperature is maintained, the increased residence time subjects the juice to over-pasteurization. For pasteurizers equipped with holding cells of fixed volume but which operate at multiple capacities or process juice at constantly varying flow rates, PU control may be incorporated into the control system. In this case, the operator selects the desired PU value. The control system will automatically adjust the pasteurization temperature to correspond to actual juice throughput (and effective holding time) to maintain the specific PU. The pasteurization effect depends on the residence time in both the holding cell and the heat exchanger. 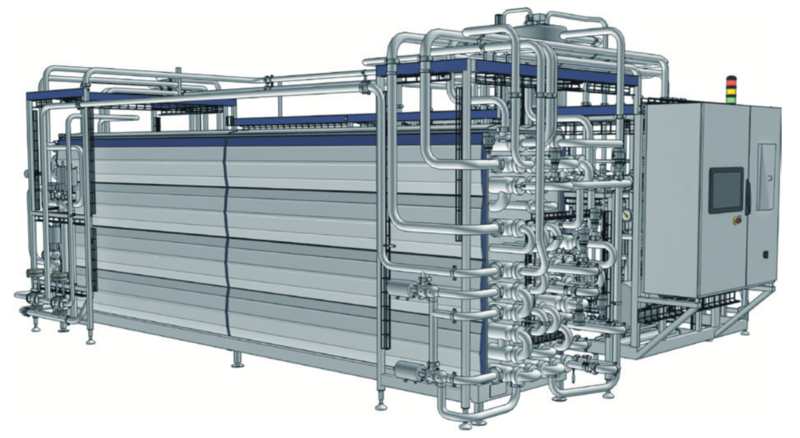 Typically 10-30 % of the total pasteurization effect takes place in the heat exchanger. The control system can take these parameters into account. Pasteurized juice is ready for filling into consumer packages. In most cases the pasteurizer is linked directly to the filling machine(s), which makes the two systems interdependent. However, the two systems can be operated independently by installing an intermediate aseptic buffer downstream of the pasteurizer. The buffer tank is generally connected to the product line as a “floating” buffer. 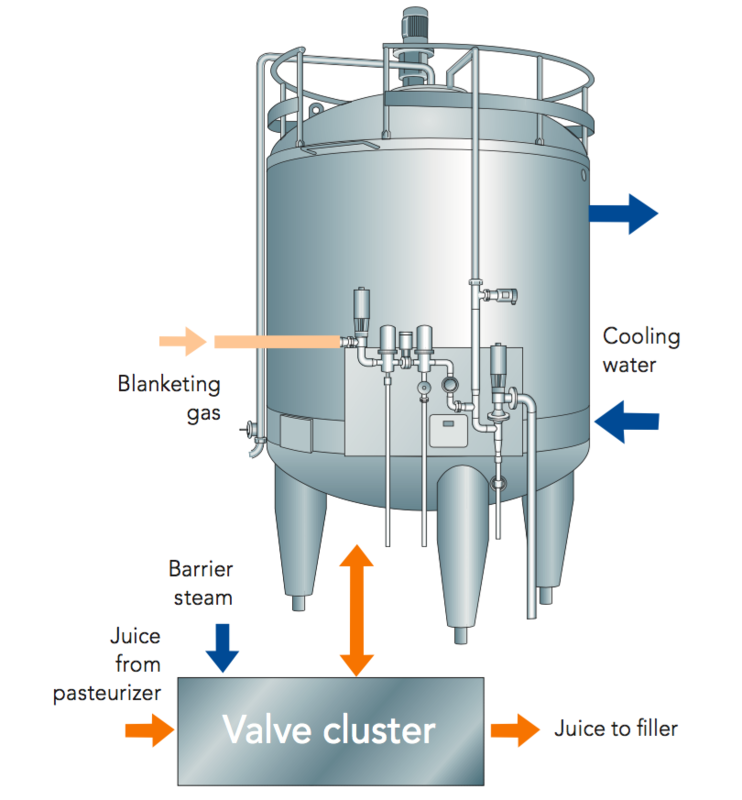 Most of the juice flows directly from the pasteurizer to the filler, and only juice that is in excess (or shortfall) for the filler demand flows into (or out of) the buffer tank. 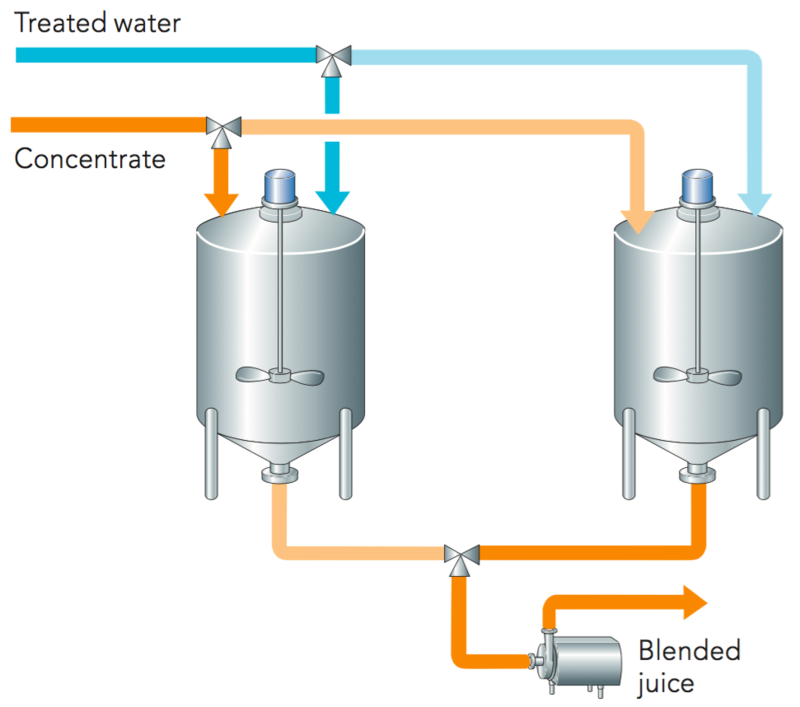 If blending of several juice streams is desired (and the buffer tank is used for blending) product may enter the tank through a separate inlet and leave via a separate outlet. A constant positive pressure is maintained in the buffer tank by a blanket of sterile gas (air or nitrogen). The juice is fed to the filler by the positive pressure. An aseptic buffer tank system adds to the capital and operating investment of a filling plant. On the other hand, a well-designed aseptic buffer system saves production time, reduces production losses, provides flexibility in scheduling, reduces energy consumption, and eliminates over-processing of heat-sensitive products. Conventional tanks (equipped with CIP) are sometimes suggested for use as buffer capacity downstream of pasteurization. However, for aseptically filled juices and non-aseptic chilled juices of long shelf life this solution creates an unacceptable risk of microbiological recontamination. The savings in investment cost do not compensate for the high product value at risk. For aseptic tanks “floating” on the production line, a buffer capacity equal to one hour’s production or more is recommended. Tanks for single-strength juice can have round-shaped bottoms while conical bottoms are preferred for handling high-viscosity concentrates. Tanks of heavy-duty design are needed to withstand overpressure during production and steam sterilization, and full vacuum. A cooling jacket enables rapid cooling after sterilization. Figure 7.16 shows an aseptic tank including the connections for product flow and service media. Prior to taking in product, the tank is pre-sterilized with steam at a minimum of 110°C for 30 minutes. The tank is then cooled down by water circulating through the cooling jacket. During cooling, sterile gas is fed into the tank to prevent the creation of a vacuum. The piping system is sterilized along with upstream and downstream equipment. During production, sterile gas fills the tank space above the product level. Positive pressure is required in the tank at all times or else the system is not considered sterile. Pressure is controlled to maintain the feed pressure required by the filling machine. Juice is not pumped but flows to the filler by means of the pressure differential. For deaerated juice, the use of nitrogen as a blanket gas is recommended to prevent air from being reintroduced into the juice. A valve cluster directs the product flow, cleaning liquids and steam to and from the tank. The valves should be of aseptic type and shielded with barrier steam to prevent reinfection. For juice with added floating cells, it is preferable that the aseptic tank is equipped with a variable speed agitator to maintain a homogenous mix in the tank. Moreover, the agitator should be of steam-shielded aseptic design. Operation of the aseptic buffer tank system may be automatic or manual. The former is preferable as it ensures high safety and correctly timed process steps. As the name implies, hot filling involves filling the package with hot (>84°C) pasteurized juice. Unlike aseptic filling at ambient temperature, the package is not aseptic when filled and the hot juice is used to kill the microorganisms on the container surface. The necessary fill temperature and “holding time” in the package depend on the type and size of container and its degree of initial microbial contamination (see also subsection 9.6.3). Containers used in hot filling are typically glass and plastic bottles, and cans. The hot filling technique is old. It allows the use of simpler processing and filling equipment than for aseptic “cold filling”, but at the cost of higher energy consumption and heat load on the product. Recent designs for hot fill systems aim to speed up packaged product cooling and increase heat recovery. Nevertheless, the choice of hot filling is not based on product quality but on other factors, such as package type, distribution methods and availability of equipment. Figure 7.17 shows the basic steps for pasteurization and filling. The pasteurizer for hot filling is quite similar to that used for filling juice at ambient temperature. The heat exchanger, however, is more compact as there is only a little cooling of pasteurized product. Figure 7.18 shows a flowchart for a pasteurizer with tubular heat exchangers used for hot filling. Plate heat exchangers are also commonly used for hot fill systems. Incoming juice is heated to pasteurization temperature (typically 90-98°C) in the heat exchanger and then held at that level as it passes through the holding cell. Juice then flows to the trim cooler, where it is cooled to the desired fill temperature (typically 84-95°C) before entering the filler. The pasteurizer system usually includes a return cooler for juice overflow and to avoid overheating juice that is recirculated during filler stops. Fillers for hot filling normally work with a pressurized filling tank, though fillers of less complex design may work at atmospheric pressure. The type of filler will determine the need for a deaerator unit within the pasteurizer. Upstream deaeration of juice prevents problems with foaming in the containers. The solubility of oxygen and other gases in juice is low at the high filling temperatures deployed. Filled packages are held at fill temperature for a specific time and then cooled by cold-water spray in the cooling tunnel. The cooling water flow is usually counter-current to increase heat efficiency and reduce thermal shock, particularly with glass bottles. After cooling, the containers pass through an air blower for drying before being sent to labelling and secondary packaging. When NFC is supplied to the juice packer in aseptic bags, there are several different ways to unload the juice from the bags (see subsection 7.2.4.). It is possible to withdraw the juice aseptically and then transfer it to consumer packages under aseptic conditions. This eliminates the need for repasteurization and avoids additional thermal treatment of the juice. In an aseptic transfer system, the complete piping and valve system from the emptying valve at the unloading station to the filler valve is sterilized before the production run. After connecting each new bag to the unloading station (but prior to juice withdrawal) the emptying valve and bag connections are sterilized. The nature of an aseptic transfer system does not allow inspection of the incoming raw material in the same way as other production processes at the juice packer. Hence, high and consistent product quality is particularly important. High pressure processing, often simply referred to as HPP, is a cold pasteurization technology to inactivate microorganisms. This process exposes retail packaged food to a very high isostatic pressure of 5,000-6,000 bars for a few minutes (see Figure 7.19). The high pressure damages microbial cells in the vegetative, or growth, phase but does not kill bacterial spores. Products treated by HPP must remain in the cold chain and not be distributed at ambient temperatures. HPP treatment may extend the shelf life of freshly squeezed orange juice to 30 days or longer, depending on the initial contamination of the packaged juice and the conditions applied. During storage the orange juice separates into a clear liquid above a bottom sediment. This is because typical HPP operating parameters (6,000 bar for three minutes) reduce the enzymatic activity of PME by only 70-80%, which is not enough to prevent cloud loss and separation. High pressure processing is a batch process comprising several steps (see Figure 7.20). First, the packages are loaded into circular baskets, either manually or by a robot, before the basket is transferred into a steel pressure vessel. After closing, the vessel is filled with cold water and the pressure increased to the desired level by a high-pressure pump. Pressure is maintained for one to five minutes, depending on the product. Following a controlled pressure release, the baskets exit the vessel for unloading and secondary packaging. Not all package types are suitable for HPP. The container must withstand volume contraction due to compression of the liquid by the high pressures used. PET and HDPE bottles are used for HPP-treated fruit juices. The bottle design is important, both to prevent water ingress around the neck when high pressure is applied and to minimize empty space in the loaded baskets. Following outbreaks of illness in the US caused by poorly treated juices, current US regulations require all commercial juices to undergo a pasteurization treatment guaranteeing at least a 5-log reduction of vegetative pathogenic microorganisms such as E.coli O157:H7, Salmonella and Listeria monocytogenes. While heat treatment at 72°C/15 sec readily achieves 5-log reduction of the relevant pathogens, the inactivation effect of HPP is considerably lower and needs to be individually assessed for different juices to ensure that 5-log is reliably attained. The throughput of HPP installations is relatively low. The largest units can treat up to 5,000 litres of product per hour, at a typical batch cycle time of 6-7 minutes. High energy consumption, combined with the heavy capital investment and limited output of HPP systems, restrict the use of HPP technology in the juice segment to premium and niche products. HPP goes under several names, including ultra high pressure processing (UHP) or pascalization. Sometimes it is also called cold pressed (CP), which may create confusion since “cold press” commonly refers to juice extraction at low temperatures. For good operational results, effective cleaning of plant equipment used for juice packing is essential. Depending on the size of the plant and its automation level, cleaning-in-place (CIP) is carried out in different ways. The cleaning unit is a dedicated system, frame-mounted or assembled on site, for preparing and supplying cleaning solutions to the processing equipment according to specified cleaning programs. The programs include selection of liquid, predefined temperatures and time periods. More advanced programs also allow selection of flow rates. Cleaning solutions are returned to the cleaning unit for reuse. Conductivity meters for measuring the concentration of detergent in solution may be used to check this concentration and to differentiate between the detergent solution, rinsing water or product. The cleaning unit also provides hot water to pre-sterilize the equipment prior to production start. No separate cleaning unit but detergent is added, often manually, to the processing equipment to be cleaned, for example to the balance tank in a pasteurizer system. Small cleaning units installed locally in the plant serving a couple of processing units each. A large central cleaning unit that provides cleaning media for the whole or part of the plant. A small self-contained cleaning unit is illustrated in Figure 7.21. Processing equipment must be designed with careful consideration to cleanability. This is not only to allow cleaning of all surfaces, such as carefully dimensioned spray nozzles, but also to minimize the interphase volumes because they result in product losses and additional use of cleaning agents. Efficient CIP gives good hygienic results and minimizes cleaning and lost product costs. The use of automation in cleaning also improves efficiency. It ensures consistent results as every cleaning cycle is repeated as specified. Detergent is recovered for reuse, which also contributes to reduced costs and less environmental pollution. In determining cleaning procedures, four cleaning parameters are considered – temperature, time, chemical and mechanical. The interaction between these parameters determines the cleaning result. This is illustrated in the “cleaning circle” (see Figure 7.22). Examples of cleaning cycles are given in Table 7.5. Choosing the correct temperature for the cleaning agent used and type of fouling is a major factor in achieving effective CIP. The longer a cleaning liquid is allowed to circulate, the better the result. However, after a certain period of time, the effect of additional time is negligible. This means choosing the right type of detergent at optimal concentration. Excessively weak solutions will not work properly, while excessively strong solutions increase cost and may be corrosive to equipment. Increased flow rates give higher turbulence and better mechanical removal of deposits. Insufficient flow rates are often the cause of unsatisfactory cleaning results. Caustic soda is a traditional cleaning liquid for daily use at the juice packing plant. It is commonly used as a water solution of 0.6-2% concentration. The solution dissolves and removes coatings of organic matter. Caustic soda is also referred to as lye or its chemical name sodium hydroxide (NaOH). It is strongly alkaline. An acid solution (such as 1% nitric acid) is required to remove calcium deposits and other mineral salts. This is used less frequently than caustic soda as the high acid juice retards the build-up of such deposits. In addition to these primary cleaning solutions, various kinds of complex detergents containing surfactants, emulsifiers or other useful additives are available from specialty suppliers. After use, cleaning solutions of high pH may be routed to a tank where they are neutralized with acid before being discharged. In this case, spent cleaning solutions and flushing water from the cleaning unit flow past an in-line pH meter. Liquids with a pH value exceeding a preset value are diverted to the neutralization tank to prevent the effluent stream from being too alkaline before discharge. Demand is increasing for lower operating costs, optimized downtime and minimized carbon footprint. Field studies show it is possible to optimize CIP in juice plants without using stabilizers. Detergent concentration and circulation time can be reduced, as can rinse time and water consumption, corresponding to the lower concentrations and shorter duration shown in Table 7.5. * Use of preheated water reduces equipment cooling during the intermediate water rinse. To reduce interphases with water at product change-over or at the start of cleaning cycles, “pigging” may be carried out in some parts of the processing plant. During pigging, an object the same size as the internal pipe diameter is forced through the piping by compressed air or flushing water. The object is often similar to a ball or large cigar but referred to as a “pig”. The pig pushes any residual product in the pipes forward to downstream processing equipment or to a collection tank. Pigging systems can be useful for recovering high-value products like concentrates and aromas but they require special engineering solutions for valves. There are two major quality factors for the final product – the juice’s properties and microbiological condition. Most of the properties of the final juice are not influenced by juice packer operations but stem from the raw material. The quality specifications for the raw material are stipulated at purchase. For reconstituted juice, the most important quality control parameter at the juice packer is the concentration, or Brix level, of the juice. When pulp has been added, the concentration of floating pulp in the juice must be checked. For NFC, Brix level is checked for unintentional dilution and content of floating pulp, if added. The sampling frequency for verifying Brix level varies but should be one to two times per hour (packaged product). The same sampling frequency is used to check the content of floating pulp. For blending systems with in-line Brix analysis, juice samples from the blending room should be taken for laboratory analysis one to two times per hour. For batch blending, samples for Brix control are taken from each batch before juice is withdrawn from the tank. Sampling and full laboratory analysis of juice properties on juice produced from each batch of concentrate is recommended. (See section 2 for further discussion of juice properties). The procedures for sampling and microbiological control of end-product differ between juices aseptically packaged and juices filled into non-aseptic packages for chilled distribution. Yeast is by far the most common spoilage organism in juice. Yeast contamination is usually accompanied by extensive gas formation, especially when oxygen supply is limited. Hence, spoilage by yeasts tends to result in blown packages. Spoilage by moulds is very rare in aseptic packages with very low oxygen content. Low oxygen pressure suppresses mould development. Some strains of acid-tolerant Lactobacillus grow faster under low oxygen pressure. They break down sugars to lactic acid with no gas formation. Spoilage caused by Lactobacillus spp. usually results from insufficient cleaning and presterilization of processing equipment. Such spoilage will normally occur at the start of a production run. The action of these bacteria usually results in a high level of defects. Sampling to detect yeast spoilage is recommended throughout a production run, while checks to detect any spoilage by Lactobacillus spp. should be carried out at the start of production. Some procedures for microbiological control of the end product are given below. However, it should be kept in mind that end control of packaged product does not replace hygienic control and preventive measurements in the plant. Inspect the juice visually and by other sensory means (smell). Also perform microbial detection tests on agar plates of different media. The sampling procedures to detect microbial contamination of juice filled into non-aseptic packages vary between juice packers. The appropriate end control depends on the shelf life of the packaged juice and the distribution temperature.